Welgelegen is Afrikaans for well-situated. 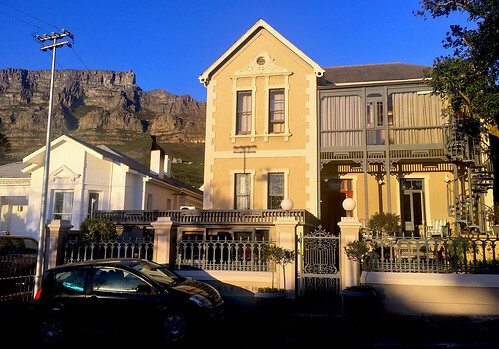 Located in the Oranjezicht neighborhood of Cape Town is a namesake guest house, comprising all of 13 rooms, housed in two late 19th-century Victorian buildings. With Table Mountain visible right behind, it certainly lives up to its name. For me, its the perfect antidote to nearly 17-hours of flying. 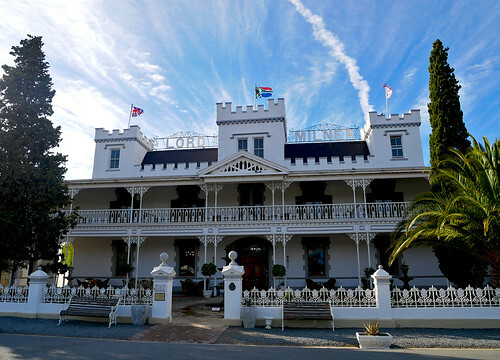 The boutique guest house sits in the shadow of one of Cape Town’s most frequented landmarks, so despite my long passage to the country, a visit seems in order. Once atop, its several degrees cooler, with strong winds ready to blow off every unsuspecting visitor, and their selfie-stick. The Dassie roams freely here, and its not uncommon to find one perched, undeterred by the gale-like conditions, precariously on a cliff. 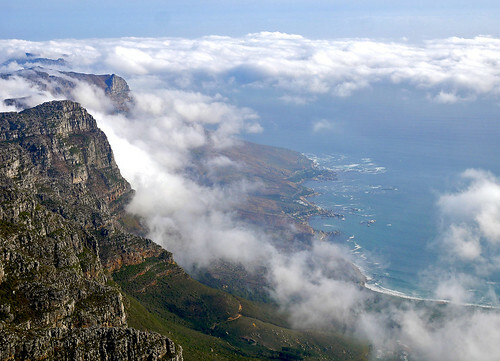 Down below, the cloud cover has begun to lift, revealing spectacular views of the Mother City, and the southern Cape Peninsula. 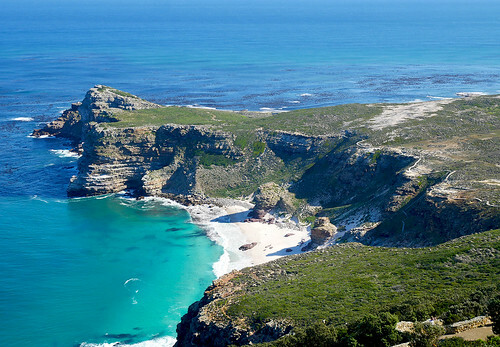 Along that peninsula, only a couple miles south of Table Mountain, lies Camps Bay or Kampsbaai. 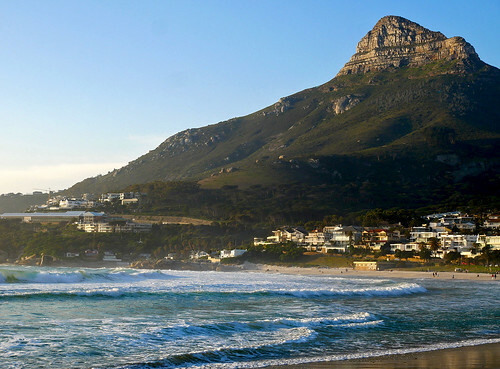 An affluent suburb of Cape Town, its best known for its beach, set to the dramatic backdrop of Lion’s Head. Expectedly, it makes for a perfect sundowner locale. Kloof St. connects Oranjezicht with the Gardens neighborhood of Cape Town, and along it lie a string of popular eateries, bars and clubs. Toni’s on Kloof, a Portuguese – Mozambican restaurant finds mention in more than a handful of blogs, and its also highly recommend by Benson, the concierge I’ve been chatting with at the Welgelegen. They’re spot on. The grilled calamari and peri peri chicken are more than stellar, and a glass of chardonnay at 32 rand is an absolute steal. I couldn’t be more pleased. Up earlier than my instincts would allow, I head out to Pipe Track, one of many trails that criss cross Table Mountain National Park; a favorite among trail runners and dog walkers, neither of which I am. Nevertheless, an invigorating morning run ensues, with jaw-dropping vistas for company. Pausing every mile or so to catch my breadth, and a view, I don’t seem to mind the sleep deficit, for a change. About half way between Kloof St. and the city center lies Company’s Garden. Named for the Dutch East India Company, it was created in the 1650s to provide fresh produce for ships rounding the Cape, and Cape Town’s colonists. 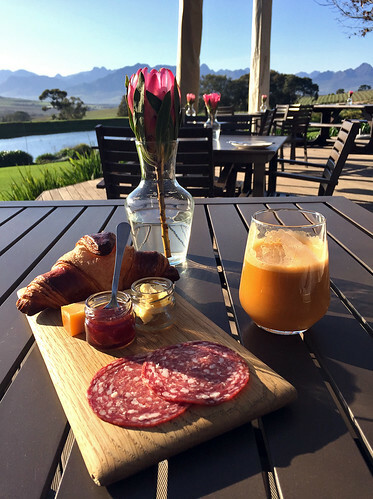 Today, its a delightful place to wander about in, replete with museums, monuments, memorials and fountains; gardens containing some of the oldest cultivated trees in South Africa; and a restaurant in the most sylvan of settings. Spending less than a few hours here seems unjust. An entire day, effortless. In the 70’s, not far from the tranquil environs of Company’s Garden, the apartheid regime was busy uprooting 60,000 inhabitants of an inner-city residential area, District Six; packing them off to distant townships, in what was to become one of the largest incidents of forced removal, and subsequent segregation. The District Six Museum serves as testament to that heinous era, and the district itself has evolved into an arts and cultural hub today. The museum lies on vibrant Buitenkant St., and further along it is Haas Coffee, one of several exceptional coffee houses the city boasts off. I pause here for a shot of caffeine, and a chance to ponder. 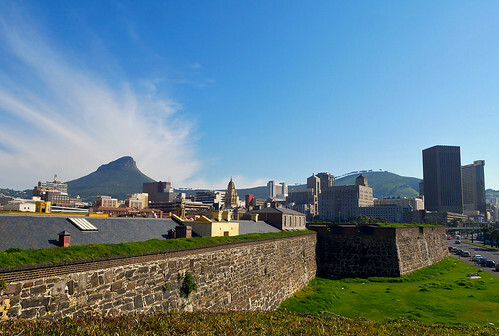 Not far from District Six lies the Castle of Good Hope. Built as a bastion fort in the late 17th-century by the Dutch East India Company, and known locally as “the castle”, it is the oldest existing colonial building in the country. 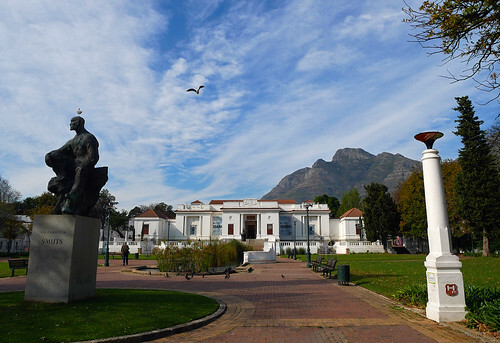 In later years, the castle served as local headquarters to the South African Army in the Western Cape, and today houses the Castle Military Museum. 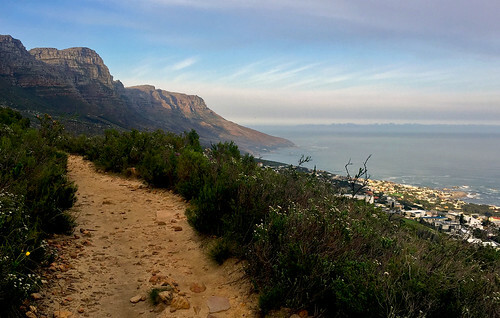 Its a nice little respite from the bustle of the city center, and a walk along its rampart offers lovely views of downtown, framed by Lion’s Head and Signal Hill. When the Dutch arrived in these parts, they were met with great resistance from the aboriginal tribes of the Western Cape. Their solution? Bring slaves in from other colonies, notably Malaysia and Indonesia. Over the years, in the shadow of Signal Hill, a Malay quarter began to emerge. Most of the new residents were Muslim, and today, the area is still home to several mosques, and establishments bearing Arabic names. 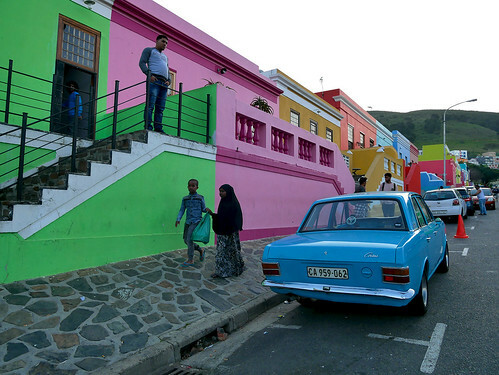 Well-known for its colorful homes, and narrow, cobblestoned streets, Bo-Kaap continues to serve as the historic center of Cape Malay culture in Cape Town, and a delight for Instagrammers. Despite Christianity being the dominant faith in the country, churches are few and far between. And none of them, at least in the Western Cape, are particularly grandiose. The seat of the city’s archbishop is no exception. But despite its relatively modest Gothic exterior, it’s served a vital role over the years. Designed by Sir Herbert Baker, St. George’s Cathedral was completed at the turn of the 20th-century. During the apartheid-era, Desmond Tutu presided here as the country’s first black archbishop, and the church began to be known as the “people’s cathedral”. In ’94, South Africa got its first democratic government. Sometime between then and now, the cathedral’s vault was repurposed, and the aptly-named Crypt came into being. 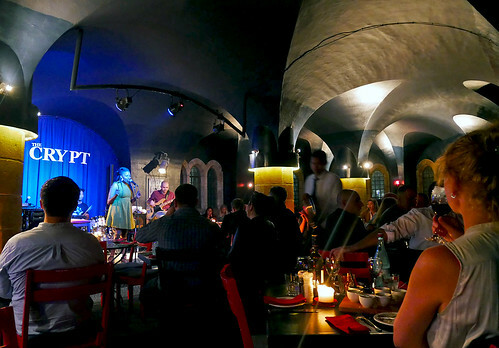 A rotating cast of first-rate jazz musicians perform here each night, and its where I’ve come to spend my penultimate evening in Cape Town. On the eastern side of the Cape Peninsula lies Simon’s Town, a pleasant 80-minute drive from Cape Town. Founded in the late 17th-century and centered around False Bay, Simon’s Town has been a naval base and harbor, first for the Royal Navy and now the South African Navy, for more than two centuries. 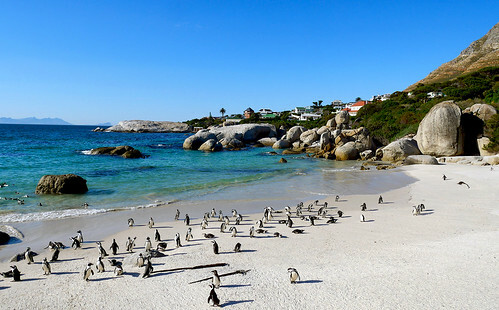 On the southern edge of town, past its charming historic center, lies its most visited landmark, Boulders Beach. A series of sheltered bays, nestled between large granite boulders – some dating back to 540-million years – giving it its name. More recently, its been home to the African Penguin, a substantial colony of which settled here in the early 80s. Photographs taken, its now time to check off three continents, where I’ve seen from up close, this most lovable of aquatic birds… By the time I get there, there are no parking spots left, and I’m greeted by a long line of visitors eager to be photographed with a sign that spells out, Cape of Good Hope. A good many of them probably oblivious to the fact that the southernmost tip of the continent is in fact at Cape Agulhas, some 150-kilometres (90-miles) to the east-southeast. I follow suit, patiently awaiting my turn to be photographed with said sign. Then scurry towards my illegally parked vehicle, and drive off towards the higher reaches of Cape Point Nature Reserve. From the car park, the Flying Dutchman funicular provides access to the old Cape Point Lighthouse; an expansive view of the promontory that makes up Cape Point Nature Reserve, and a few hundred feet below, a chance to truly appreciate the rocky headland that is the Cape of Good Hope. 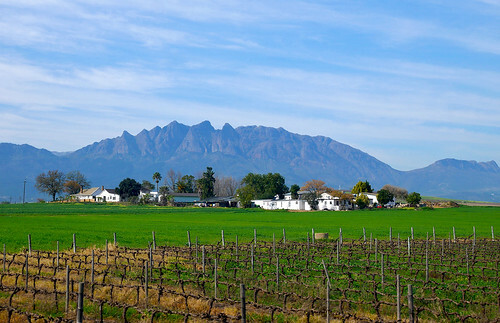 Of the three major wine-growing regions in the Cape Winelands, Stellenbosch lies closest to the Mother City. With more than half the route tracing the perimeter of False Bay, its another gorgeous drive getting there from Cape Point. I’m staying the night at Jordan Wine Estate, and by the time I get there, the sun has started to dip behind Stellenbosch Mountain. Hardly any reason to despair though. 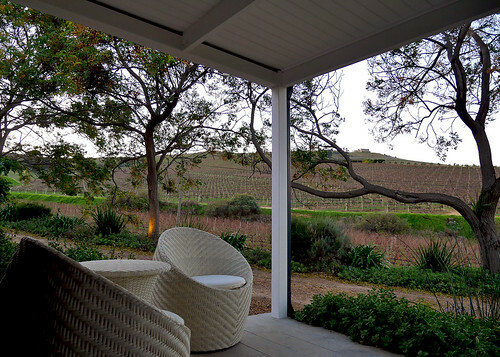 I have a bottle of unoaked chardonnay, and an in-room massage awaiting me… For dinner, on the recommendation of a friend, I have a reservation at Indochine, one of two restaurants at Delaire Graff Estate, a neighboring vineyard. Exceptional in every way – the seafood vindaloo and kiwi-cuke sorbet being the standouts – its also one of the most reasonable meals I’ve had in a restaurant of that caliber. Up early to watch the sunrise from my patio, I’m already looking forward to my next meal. The Bakery at Jordan offers a hard-to-beat breakfast setting, and even before I can take it all in, my pre-breakfast plate of goodness arrives. I begin to regret my decision of staying here just the night. Barely minutes past the breakwater, we are greeted by a school of Bottlenose Dolphins. I’m on board Southern Right Charters “Miroshca“, a purpose-built twin-hulled catamaran, which has just set sail from a little jetty on the Hermanus waterfront. Often referred to as the capital of the Cape Whale Coast, Hermanus is one of the premier sites for whale-watching in the world. 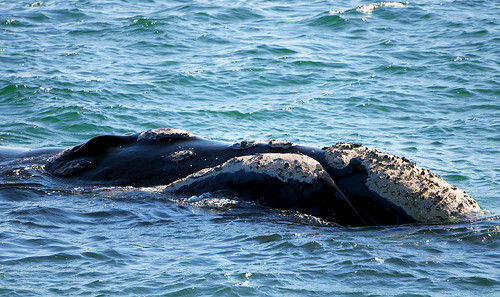 During the Southern Hemisphere’s winter months, Southern Right Whales migrate to the coastal waters here to calve and mate. Further out on Walker Bay, we come across a lone kayaker. He poses for us with a baby shark he’s just caught, and after the paparazzi have had their fill, releases it back into the water. Moments later, there’s a stirring on our starboard side – a pair of Penguins have been spotted. To our port side, a rookery of Reed Cormorants flying low along the water’s edge. And somewhere in-between, herds of Seals can be seen congregating around their favorite pastime, kelp. Three o’clock, our guide Dave calls our attention to. 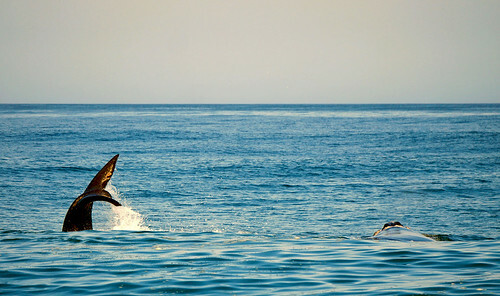 Its a whale sighting, but mother and calf are headed south, and away from us. A few minutes pass and the catamaran turns towards the coast. This one’s clear as day. We get closer to the whale, which turns out to be a female. Adult Southern Rights measure up to 59-feet in length and 80-tonnes in weight. She has a calf in tow, currently perfecting the art of tail slap. The Southern Rights, Dave informs us, are readily distinguished from others by the callosities on their head, and the absence of a dorsal fin. We’ve now spent over an hour, totally mesmerized, in the company of these spectacular cetaceans. Sadly, its time to head back. But not before one last look at the ever endearing sight of mother and calf frolicking in the waters of Walker Bay. Hermanus, my last stop in the Western Cape, lies 120-km (75-miles) south east of Cape Town; about 90-minutes in terms of driving effort. I drop off my rental and head towards the Victoria & Albert Waterfront for my last evening in the city. Located along the Atlantic shore and spanning over a hundred acres of mixed-use development, the V&A Waterfront is one of Cape Town’s most visited attractions. Ferries to Robben Island leave from here; there are marinas, charters and tour operators dotting its many basins; and a large swath of it continues to serve as a working harbor. Despite being fairly touristy, its a fascinating place to walk about in; full of history and historical edifices, and a guarantee of scenic views around. 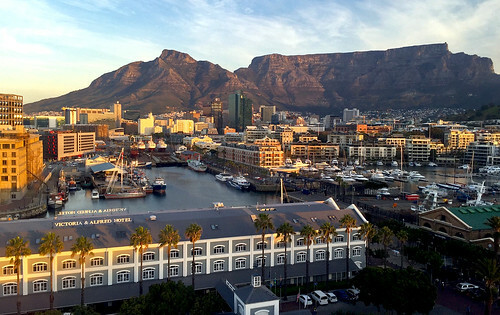 The Cape Wheel is probably the areas newest attraction, and timed around magic hour, provides a lasting memory to leave the Mother City with. 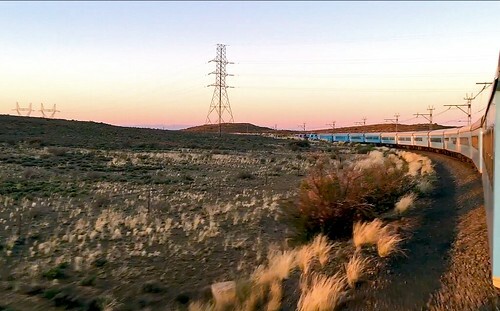 Plying between Cape Town and Pretoria, the Blue Train is synonymous with luxury rail travel, and most, if not every one of you, have at least heard of it. There is, however, a significantly more cost-effective, albeit poorly publicized, way of getting to Johannesburg, and by extension, Pretoria – Premiere Classe. My single occupancy cabin on Premier Classe is more than adequate, but seeing that the train is not particularly busy on this Tuesday departure, I’ve requested a larger one. We’re an hour or so out of Cape Town at this point, past its suburban sprawl, and there’s a knock on my door. I’ve been upgraded. And just in time too. We’re now in the vicinity of Paarl, traveling through the lush Cape Winelands. Our champagne reception in the lounge car gradually blends into lunch in the dining car. Outside, the vineyards have given way to orchards full of peaches, table grapes and olives, and behind them lie the rugged Hex River Mountains, part of the Cape Fold Belt. Past Worcester, the largest town in the Western Cape’s interior region, we begin our ascent into the Great Karoo. Intermittent spells of darkness follow, as we go through a series of tunnels, which help the railway take the shortest possible route through the Hex River Mountains. The last of these, at 13.5-km or 8.4-miles in length, is the longest mainline rail tunnel in the continent. Its almost 3 pm local time, and we’ve just pulled into Matjiesfontein, the only stop on our route where we can disembark. A charming little hamlet on the edge of the Karoo desert, Matjiesfontein is known for its Victorian character. A few steps into the station forecourt and its easy to understand why. The Karoo constitutes few defined borders, its semidesert like setting covering a humongous swath of the country. To its north, where it becomes even drier, it blends into Bushmanland, and eventually the Kalahari Desert. As our train continues its march towards Johannesburg, long shadows have begun to form on our east. We have an hour or so of daylight to go, and the promise of a sundowner like no other. By the time we pull into Johannesburg Park Station, I’ve already exchanged numbers and email addresses with a handful of my fellow travelers; an American couple from the Bay Area, a South African family who live in Mauritius, and a couple from Jo’burg itself. 26-hours on Premiere Classe was all it took to cement a bond between total strangers. That’s what train journeys do for you. I get a quick bite to eat at Rosebank Mall, then board a City Sightseeing bus for downtown Jo’burg. Its one of those hop-on, hop-off double deckers that I typically loathe, but every now and again, one has to make the exception. Safety concerns (a lot of them unfounded, I imagine) and a paucity of time, in this instance. Through the tonier neighborhoods of Riviera, Houghton and Parktown, we work our way down to Braamfontein in the city center. Moments later, I’m roaming the complex that makes up Constitution Hill. On one side sits the country’s Constitutional Court, the upholder to all that a free South Africa stands for today; an attractive edifice with all eleven official languages of the country proudly displayed on its facade. 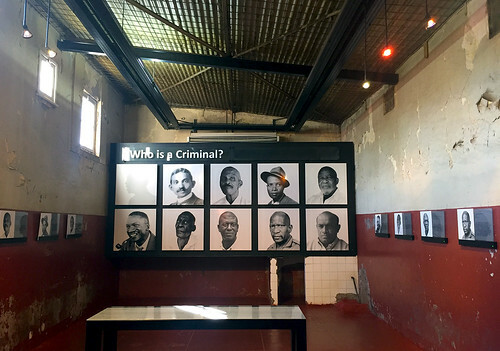 On the other, the Number Four prison block, a haunting reminder of the countless atrocities that were committed, not long ago, during the Apartheid-era. Its all very poignant, no doubt, but also very enlightening. “It was the opposite of grand, but it was my first true home of my own and I was mightily proud”, said Nelson Mandela of his humble abode at 8115 Vilakazi St. Mandela spent less than two decades here before being sentenced to life imprisonment in 1964. He returned, only briefly, after his release from prison in 1990. 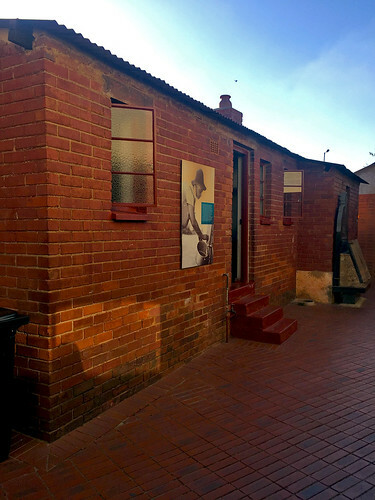 The Mandela House Museum opened at the end of ’97, putting the South Western Townships or Soweto on the global map. It doesn’t take long to see, and there’s not a whole lot to do around it either, but the detour here is definitely worth your while. Think of it as a little gesture, towards a neighborhood that cradled one of the greatest men to ever grace our world. Barely over a century old, Johannesburg was founded in 1886 as a little village, following the discovery of gold in the area. But the Gold Rush that ensued brought with it an unexpected surge in population, and by 1928, Jo’burg was already the largest city in the country. 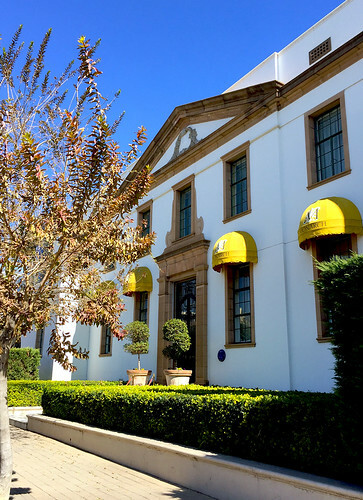 The Randlords, as the diamond and gold entrepreneurs came to be known, are long gone, of course, but sprinkled across the higher reaches of the city, a substantial portion of their legacy remains. 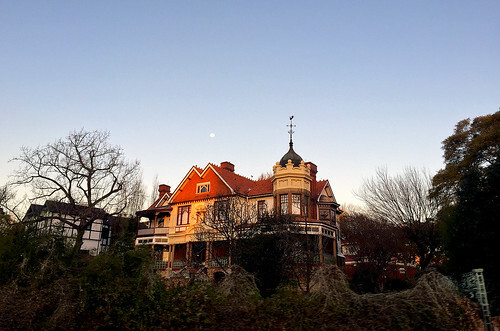 The stately mansions of Parktown run the gamut in terms of their girth and architectural-styles, and on my bus ride back to Rosebank, I get a chance to marvel at some of them. Located to the north of central Jo’burg, Rosebank is a much sought after commercial and residential suburb, one that’s fairly popular among expats too. The Rosebank Mall is a hub of activity here, and despite having the usual roster of global brands, it does carry a few staples – Nando’s being one of them. Nothing more apt than that for my last dinner in South Africa. Walking to the Gautrain station, I take a good look at the Monarch, the hotel in Rosebank, where I stayed the night. Much like the Welgelegen, its another exemplary property and a perfect bookend to my time in South Africa. A former telecom exchange, turned post office, turned boutique hotel, its also a fitting metaphor to this country, one thats constantly going through upheaval and transformation. A full set of photographs from my visit to South Africa can be seen on my Flickr.